Used games will not only play on PS4, but Sony is supporting offline play with no DRM, the company announced at its E3 press conference. 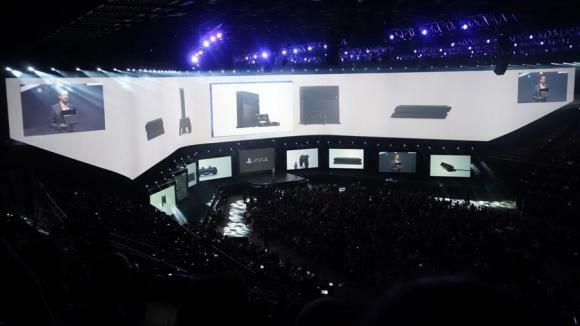 Sony Computer Entertainment America unveiled the PlayStation4 (PS4) hardware design at its annual E3 press conference, where the company also announced its next generation platform will launch in the United States for $399 this holiday season. In addition, Sony showcased an extensive line-up of exclusive first and third party content for PS4, PlayStation Vita (PS Vita) and PlayStation 3 (PS3) systems, and a next-generation PlayStation Plus (PS Plus) membership program. "We are proud to unveil today the most advanced gaming system ever created, PlayStation 4, which demonstrates everything PlayStation stands for — a relentless focus on the gamer, an inspired community of developers equipped with the most powerful technology, and the long-standing legacy to building worlds without boundaries through one-of-a-kind gaming experiences," said Jack Tretton, President and CEO of SCEA. "What's equally exciting for us, however, is transforming the PlayStation ecosystem into a stronger, more vibrant destination that enables gamers to engage, share, play, and connect on their terms." Sony said the PlayStation 4 has a sleek, modern, and elegant look, the overall design of the PS4 system reflects the powerful yet accessible architecture of the system, which will inspire developers to unleash their imaginations and create the next generation of gaming experiences that were never before possible. Sony World Wide Studios (Sony WWS) is currently developing more than 30 PS4 exclusive titles, 20 of them, including 12 new IPs, are planned to release within a year of the launch of the PS4 system. This demonstrates PlayStation's focus on delivering original, creative content to gamers that will define next-generation gaming experiences. Sony WWS President Shuhei Yoshida provided an update on PS4 exclusive titles, DRIVECLUB, Killzone Shadow Fall, KNACK, which will be available at launch, and inFAMOUS Second Son, available first quarter 2014. He also unveiled Sony's next blockbuster title, The Order: 1886, from acclaimed studio Ready at Dawn. Furthering PlayStation's commitment to finding unique games for its fans by working with independent and small developers, Sony Vice President of Developer and Publisher Relations Adam Boyes introduced a stellar lineup of titles that will be making their console debut on the PS4 system, including: Transistor by Super Giant, Don't Starve by Klei Entertainment, Mercenary Kings by Tribute Games, Octodad: Deadliest Catch by Young Horses, Secret Ponchos by SwitchBlade Monkeys, Outlast by Red Barrels, Oddworld: New N Tasty by Oddworld Inhabitants and Galak-Z by 17-bit. Boyes also unveiled blockbuster content from key publishing partners, including KINGDOM HEARTS III and FINAL FANTASY XV from SQUARE ENIX, Ubisoft Entertainment, Assassin's Creed IV Black Flag and Watch_Dogs, 2K Sports's NBA 2K14, Bethesda Game Studios' The Elder Scrolls Online, and the world exclusive unveil of Warner Bros. Interactive Entertainment's Mad Max. Bungie, one of the most celebrated developers in the industry, was also on stage to introduce the world gameplay premiere of Destiny. Sony announced a long-term exclusive partnership with Bungie and Activision that will ensure that the PS4 ecosystem evolves and grows with the incredible Destiny world.